Tuba City Regional Health Care Corporation (TCRHCC) Community Health’s Mobile Medical & Dental Unit travel across the Western Navajo Chapters bringing basic primary health care and dental exams into your communities. TCRHCC Community Health, in fulfilling its mission to serve rural communities, established the Mobile Medical & Dental program. The primary goal of the Mobile Medical and Dental is to provide primary healthcare and dental screenings to the community. Learn more about our mobile units in this video on YouTube. 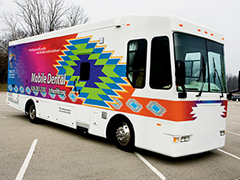 The Mobile Medical & Dental Unit coordinates with community agencies, such as schools, chapter houses, and senior centers to reach the people who need these services the most — seniors, teens and families who do not have access to medical care. TCRHCC Community Health is reaching out to people with identified health risks who may not have access to healthcare by providing the Mobile Medical & Dental Unit in the community throughout the Western Navajo Chapters. The services provided by the Mobile Medical & Dental Unit help improve the health of young people, the elderly and the medically under-served. The Mobile Medical & Dental Unit are onsite at selected chapter houses to provide services and identify people with medical problems and refer them to physicians, community agencies or medical facilities before their medical problem becomes more serious. A Registered Nurse Practitioners, a certified Medical Support Assistant, and technicians staff the van. 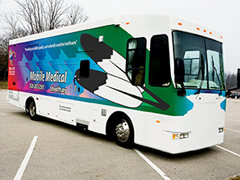 Mobile Health Units will be at various locations throughout the TCRHCC service area. Schedules and locations will be posted on this website and in public places. During the school year the Dental Unit will rotate around to the different schools. Tuba City Regional Health Care Corporation (TCRHCC) Medical Mobile Unit is offering sports physicals in the month of July and August. No appointment is necessary. 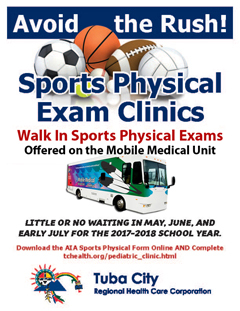 The sports physical forms are available on the Medical Mobile Unit, or pick up one from your school’s athletic director or front office. See the mobile unit schedules and locations. LITTLE OR NO WAITING IN MAY, JUNE, AND EARLY JULY FOR THE 2017-2018 SCHOOL YEAR. Please download ALL 3 forms for the Sports Physicals.